Having gone through the last few seasons such as he did, there's not much point in arguing that P.K. Subban is now one of the absolute best defensemen in the league. Even leaving aside the fact that he won a Norris, essentially as a reward for being a scoring machine on the power play, there are few guys put in worse team-related situations over the last four seasons who have been as good as Subban. The Canadiens have generally not been great for most of Subban's career; they have only 150 wins in 294 games since he became a full-time player. Their possession numbers have generally been subpar — score-close corsi over the last four seasons of 49.3 percent — but despite this fact, Subban has generally been very good. He's 21st in the league among defensemen with 2,500 minutes in those situations, at 52 percent. And most of the guys ahead of him have played for possession juggernauts like Los Angeles, Detroit, Boston, Chicago, St. Louis, Vancouver, New Jersey, and San Jose. But of course, when it comes to defensemen, many analysts and teams alike fall into the trap of judging defensemen based on their point totals. Here too, Subban is in a rare group of guys; he's seventh in scoring among just 13 defensemen to break 150 points over the last four seasons. The number of guys ahead of him on both this list and the one related to possession is four: Duncan Keith, Alex Pietrangelo, Erik Karlsson, and Byfuglien. So Subban is a world-class defenseman. Easily top-10 in the league, and at 25 he still has miles to go before he is no longer a useful player. And it just so happens he's up for a new contract after the expiration of his low-cost bridge deal — which was forced on him following a holdout — in Montreal. And that leads one to wonder what he's worth. He's still only a restricted free agent, and thus any long-term contract he signs this summer isn't, perhaps, going to be as high as if he were to hit the open market, but nonetheless it seems the Canadiens are going to have to go pretty deep into pocket to lock him up. Doing anything else is a fool's errand. There were rumors back around the middle of the season that when the discussions begin, Subban will be walking up to the table asking for between $8 million and $9 million a season, probably for as long as the Habs can possibly give him (that'd be eight years). That would make him the highest-paid defenseman in the league against the cap, only slightly ahead of Shea Weber's nearly $7.86 million a season until 2026. There are currently nine players in the league carrying a cap hit of $8 million or more, and all but Henrik Lundqvist are forwards. But if Shea Weber can get $7.86 million — albeit on an offer sheet, and for 14 seasons under the old CBA — then you have to say that Subban is worth just about as much as that, especially with the consideration that the cap is only going to go up in the coming years; within a few seasons, $8 million might only be 10 percent of the ceiling, and getting a clear top-10 defenseman for that kind of hit is a high value. The Habs really only have one other player that's going to be able to command anything resembling a star player's salary within the next handful of years (unless they really love Max Pacioretty, signed through 2019 at $4.5 million per, more than they should), and that's Carey Price, who already makes $6.5 million and will do so until 2018. 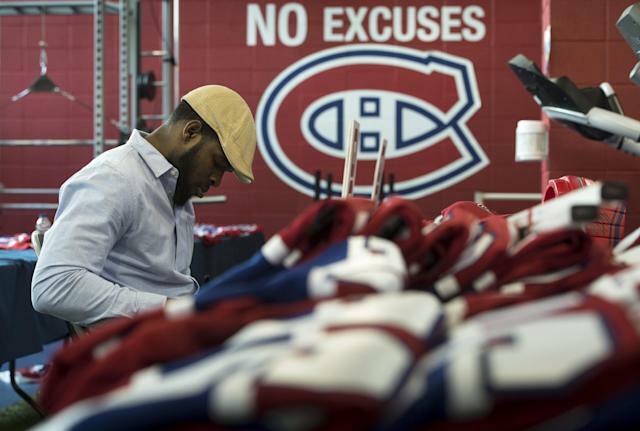 The point being that the Habs will basically be able to give Subban a blank check if they so choose. They, of course, will not. Very few players get to write their own tickets, and defensemen are not really included among that list. Alex Ovechkin can get what he wants. Evgeni Malkin can. Sidney Crosby can. Henrik Lundqvist can. Probably Steven Stamkos can. The list ends there. But if a certain report — incredible is what it is, if we're being honest — is to be believed, Subban doesn't want a lot of money at all. Andy Strickland reported this week that Subban wants a seven-year deal (which seems okay) worth $45.5 million. Run the numbers real quick and you'll find that's just $6.5 million per season. Granted that's “Erik Karlsson and Alex Pietrangelo” money, but those contracts were signed in 2012 and last September, respectively, meaning they were before the new CBA. With the cap going up, and expected to go up as high as it will, a $6.5 million starting point seems ludicrous. It seems a little low for an end point too, quite frankly, but this is a flatly bizarre suggestion, perhaps the result of a team negotiating through the media. But the thing is this: It's really hard to tell how valuable a star defenseman is overall. Harder than any other position, anyway. With forwards it's much easier, and with goaltenders it's easiest of all. For goalies you just take their save percentage and compare it with the league average. Pretty simple way of telling who's good and who isn't. With forwards, you look at point or goal production, and you look at corsi numbers (along with zone starts and quality of competition), and maybe factor in things like faceoff percentage if you think a guy has additional defensive value. For defensemen, where do you begin? As referenced in the linked Tyler Dellow post above, you can't judge a defenseman based on points alone (so many things skewing it, with the largest of them being power play time), and this position in particular is one that really requires “the eye test” to figure out beyond corsi share, qual comp, and so on. How well do they retrieve the puck on dump-ins and get it going the other way? How well do they move it through the neutral zone? How well do they control gaps coming back? How well do they cover guys one-on-one? How well do they stay in position? Subban is often attacked for doing things incorrectly, but if you watch him a lot you see that he does pretty much everything very well. What he does — consistently put up points and get the puck into the attacking zone — has largely been shown to be repeatable, in that he does it every year without fail. And he does it not because the team in front of him is particularly great, but because he's just good at it by himself. In the last three seasons, he's ranked 20th, fourth, and 11th in relative corsi with the score close. All other considerations about whether he's too much of a distraction or anything like that should fall away. But, again, that raises the question: What is Subban actually worth? The numbers show he's probably not as good as Pietrangelo, and you'd have to say Karlsson is the most game-changing blue line talent in the world today, doing everything Subban does a bit better. But he's also better than six of the seven highest-paid defensemen in the league (Weber, Ryan Suter, Kris Letang, Brian Campbell, Dion Phaneuf, and Zdeno Chara), with the lone exception being Drew Doughty, who makes an even $7 million against the cap through 2019. That, I'd say, appears to be a very reasonable baseline for Subban in terms of the percentage of his team's cap hit he should be able to expect to take up (given that I'd consider 22-year-old Doughty to be roughly equivalent in terms of value to 25-year-old Subban). Doughty signed his for $7 million AAV in just before the 2011-12 season, when the cap was $64.3 million. That meant he took up 10.9 percent of it initially, and that number has obviously gone down over time. By the same token, if you figure the cap is going to hit $70 million this season, then Subban should probably get about $7.6 million, or a little more, and that feels about right. That would make him No. 2 on the list of best-paid defensemen. I mean, if they're going to pay 35-year-old Andrei Markov, who's not as good, $6 million a season for the next three years, they have to make PK Subban very, very rich. There's no way around that. Ryan Lambert is a Puck Daddy columnist. His email is hereand his Twitter is here.